Now Galadriel rose from the grass, and taking a cup from one of her maidens she filled it with white mead and gave it to Celeborn. Then she brought the cup to each of the Company, and bade them drink and farewell. This is a white metheglin, like many similar recipes in the Closet of Sir Kenelm Digby Opened, circa 1669. One of the really unique elements of it is that an egg white is boiled into the wort near the beginning of the brewing process. 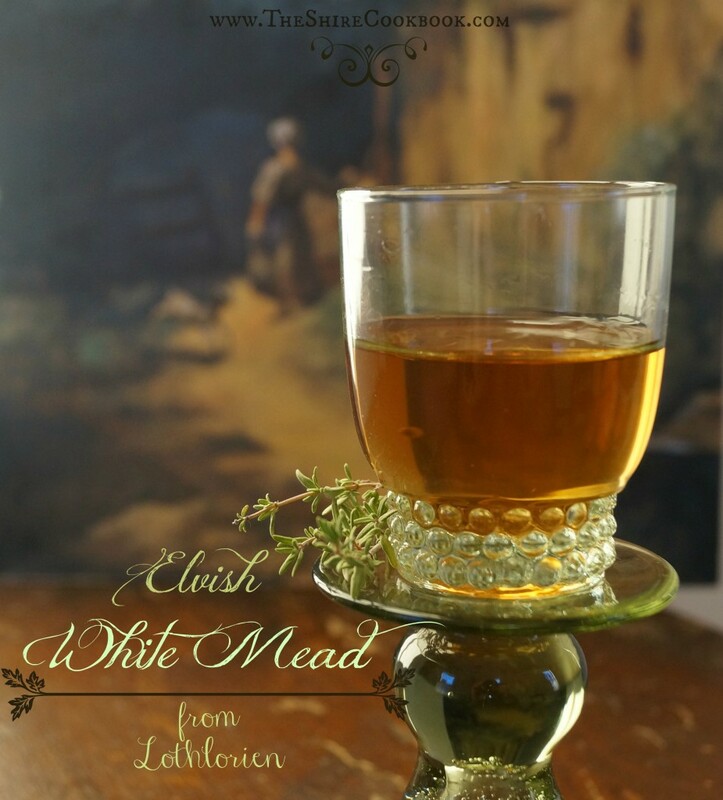 This was done to make a clear, or white, mead, and although I doubted at first, I was amazed just how well it worked. The finished brew is crystal clear, one of the prettiest I’ve made yet. At around 8%, it’s not a heavyweight mead, but retains much of the honey sweetness. The herbal and floral flavors are there, giving it an unexpected complexity. I had some fun picking out the ingredients: thyme, as a nod to how long the elves live; elder, as a play on Eldar; and then other period-appropriate ingredients, by instinct. I’m delighted with how it came out, and hope to enter it in a competition soon! Combine the honey and 1 gallon of water. Bring to a boil while stirring to make sure the honey doesn’t stick to the bottom and singe. Add the beaten egg white, while whisking. The white should cook, and rise to the top, carrying with it any impurities from the honey. Skim off anything that rises. Simmer herbs in 2/3 gallon of the sweetened water for 15 minutes, then remove from heat and let sit for another 15. Strain out the herbs, and allow the liquid to cool somewhat. Pour into a carboy, and pitch yeast when it’s cool enough. When the mead is done fermenting, bottle and age. Mine was good even before bottling, but after a month the flavors really settled in. I’m looking forward to testing it after a year! Questions – what type of hops? I’m guessing a floral variety, but there are also spicy, grassy, woodsy, and citrus types, so knowing the name of which hop you used would be helpful. What form of hops? There are pellets or whole hops – pellets give better utilization of the alpha acids making the mead just a little more aromatic, flavorful, and bitter than whole hops would. Are all herbs dried or just the ones mentioned? This would make a difference also if using whole hops. Observations – back in Sir Kenelm Digby’s day the water was impure and honey derived from the comb in such a fashion that it contained much wax, bee parts, and other impurities than it does today IF extracted from comb on the frame, and commercial producers generally filter out to some extent. Bottom line – don’t put your honey into water warmer then about 110F, just enough to melt and fully incorporate into your water – this will help you retain more honey aroma and flavor in your finished mead. That said, it is still necessary to steep the herbs and hops, so just do that first, then add honey after a bit of cooling. Thanks so much for sharing, can’t wait to try this! Looking forward to the cookbook, as well. I used mostly dried herbs, except for what I had growing in my herb-planter at the time. It’s been a while, but I think I used either Cluster or Fuggles whole hops, since those are what I usually have on hand. Enjoy, and let me know how it turns out! I am thrilled to hear about the upcoming Shire cookbook: considering how wonderful the Feast of Ice and Fire was, this one should be amazing. I am looking forward to hearing more about this in the future. Congratulations. The mead recipe looks like a pretty good one as well. I’ve been wanting to try a mead and this would be a fun place to start. Where did you locate the herbs, though? Some of them don’t seem like they would be the easiest to lay hands on, at least not in my neck of the woods. The little hippy store where I go for brewing herbs didn’t actually have hyssop in herb form, just a liquid extract. Do you have any earthly idea what I should use as a conversion factor between this and dried herbs? Don´t use it – without knowing the specific type you found, I can only say that such extracts are generally not for internal use at all, and even if so, then they are almost, but not completely, unlike the original herb. Try the vegetable/fruit part of your local supermarket; at least here in Sweden they almost always have the most common spice-herbs in small pots, for your kitchen window or planting. Roger that. I found some on Amazon. The amount they’re selling is a lot more than I actually need, but it looks like a good price, and I’ll have extra to make another batch down the road. Found mine online at The Pagan Peddler etsy.com/shop/thepaganpeddler good price I THINK. Going to do 1 batch with sage blossom honey as a nod to the wisdom of the elves. Going to try another with linden blossom honey, aka basswood, which is a bit minty almost & has a very woody flavor as it ages. Liking for hops with flavor & aroma profiles to compliment, such as Millennium (spice, herb, floral, resin) for the sage batch & for the longevity of the elves, maybe Northern Brewer or Perle for the linden batch, woodsy, minty, spicy. Where do the raisins come in? I saw them in the ingredients, but not the instructions. They go in the primary fermenter! I’ve been looking into what I need to have/know about starting to do some home brewing of my own and this looked like a good recipe to try. Are there any reference materials that you would recommend for a beginner? Always start with The Compleate Meadmaker by Ken Schramm! Thanks, I’ll be sure to pick up a copy. How do you know that it is done fermenting? Use a hydrometer to take gravity readings, it lets you know the sugar content you have remaining. Too sweet and you could easily wind up with exploding bottles. Simple to use, if you had used one before fermentation started, then towards the end, you can also calculate the alcohol content very easily. They’re inexpensive, buy online or your local homebrew store. Mead can sit around for a long time without any movement in the airlock, but don’t be fooled! That is not a good indication fermentation is complete, and as it gets cooler out the year will slow down or go dormant, so you just THINK is finished. Tricksy yeasts. The yeast will slow down, not the year!